I so enjoy a tea party. There’s nothing quite like it. The diminutive fare, each course specially crafted and then paired with a delicious tea—there’s so much to love. It’s an especially great way to teach children proper manners. The ceremony of tea captures their young imaginations and allows them to enjoy each step of the process. For those of you who share my love of tea, the editors of Victoria have created a special treat with their latest Classics special edition, Tea Pleasures. With a focus on the joys of a proper tea party, the issue includes ideas and instructions for party planning, table settings, and how to brew the perfect cup. Not to mention the menus for a variety of teatime gatherings! As a special taste of what the issue has to offer, they are sharing their suggestions for creating a lovely tablescape. If you love tea, you won’t want to miss everything Tea Pleasures has to offer! A balanced tablescape should include a fabric element, a floral or botanical element, accent pieces, and a light source that enhances without overwhelming or washing out the look you wish to achieve. The basis of a dazzling tablescape is fine linens. If your selection is limited or you are just beginning your collection, choose solid-colored tablecloths in neutral shades. These can be paired more easily with a variety of sheer fabrics, runners, and other table toppers to create different looks for special occasions. For a casual buffet, consider arranging flatware in creative containers, such as baskets, pails, or old-fashioned milk bottles. For more formal dinners, wrap individual sets of cutlery in a napkin tied with festive ribbon or braided cording. When appropriate to the party theme, use personal collections as accents, as well as the basis for centerpieces. For instance, colorful teapots can double as vases for floral arrangements, while a display of mismatched crystal candleholders on a mirrored surface adds a subtle glow. Incorporate a variety of textures in your tablescape design: porcelain, brocade, flowers and greenery, fresh fruit, silver, and vermeil—all can be mixed and matched to create a stunning table. If table space is limited, consider a hanging centerpiece. A kissing ball or a decorative wreath can be suspended easily from a chandelier or other light fixture. Display decorative items in staggered heights. This also can help open up additional table space, if needed. Use the hues and tones reflected in your china of choice as a guideline when developing a color scheme for the tablescape. For instance, if the plates are etched in platinum or gold, repeat that color in some element of the tabletop arrangement. What do you love about a tea party? I love ‘taking tea’ because it is like being transported to another time and place! If you have one Dear Enchanted Home I would love to be your guest. 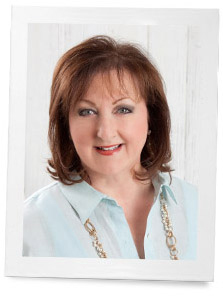 Follow your blog…lovely! I went to my friend’s tea party birthday luncheon yesterday and it was lovely and elegant. Tea (Royal Wedding tea) was served in a silver teapot with tiny sugar cubes. Desserts (cookies, mini muffins) were decked out on lovely plates. A champagne toast led off the occasion and guests could choose tea sandwiches and fresh fruit. Floral arrangements in pastel colors were set on the table along with colorful linen napkins. The men in attendance took the photos and cleared the tables and supervised the dishwasher. A tea party is so feminine and conducive to women talking and enjoying themselves and there is always room for dessert! A tea party is instantly personal because the hostess has decorated, baked, etc., for the comfort and enjoyment of her guests. And all the guests are women, who are grateful and delighted someone else did all the work! Because the fare is light, there is so much time for great conversations? My favorite tea party is one I do for soon-to-be-brides or a mother who will soon be welcoming a precious new life. I’m not a shower game person and when people are together for either of these joyous events, I like to make sure it’s all very persona and fulfilling. I call either of them a prayer tea shower. The tablescape is created using the bride’s colors or the baby’s room colors or theme. On a serving table or side table of some kind is a potted “tree” made from whitewashed or natural branches. There are silk flowers or even real flowers added to the branches to make it a lovely centerpiece for that particular table. Hanging from the limbs of each tree branch are small, lovely linen or even colored paper squares, rectangles, circles or whatever shape goes with the theme. On each of these is written a prayer request that has come from a list provided by the bride and groom or mom and dad to be. I get with them a while before this event to ask them to make this list since each couple’s circumstances of life are unique. And of course, I always add a few of my own because I’m an old grandmother and these young ones sometimes have no clue of some of the things they should have on their list. You can only do that if you know them really well, but I’ve never had a single bride or mother-to-be complain yet if it’s handled with humor and sensitivity. And I always take the prayer for brides to pray about their sexual union and oneness since everybody else is a chicken! I quote lots of Scripture in my prayer! When everyone is helping themselves to tea and treats, I point out the prayer tree covered in lovely or cute notes attached with ribbon to the branches. I ask everyone to please choose a prayer topic that has important meaning in their life so as to pray from experience for the sweet couple. Sometimes I ask certain people to take certain prayers because of their history and how it can be beneficial to the young couple. When the bride or mom is ready to open the gift from someone, that person shares how she knows the young lady or to-be husband or husband and what she has chosen to pray about for these precious young people and why. Everyone is always laughing at some of the great stories that are shared during this time or shedding a tear at some of the more poignant ones. Then the giver prays for the couple and the bride or mom-to-be opens their gift. I always ask everyone attending to make a promise to the mom or bride to continue to pray for the couple, and baby if appropriate), for the next year whenever they come to mind or think of the shower. Of course, everyone says yes! In the shower invitation I do a very short explanation of what a prayer tea shower is so that nobody will be caught off guard by being asked if they would like to choose a prayer topic off the prayer tree for the couple. I’ve only had one person say they would not feel comfortable praying in public over the many years I’ve been doing these. For me, tea is for bringing people together or enjoying an afternoon quiet time with my Bible. It’s the BEST! What is there not to love about tea parties?! If I could , I would have an afternoon tea every day. I host my friend and her daughter for themed tea parties throughout the year and it is much fun! I Love Tea Parties. I have given them at my previous work where I had staff to help with the food and serving,but I have not yet hosted a party in my home. I’m quite anxious about timing of the food and replenishing the teapots without help. I have thought of bringing a helper in to help. My husband treated me to tea at The Grand Floridian in Disney World, and The Pharmacy in Savannah, both were special days for both of us. 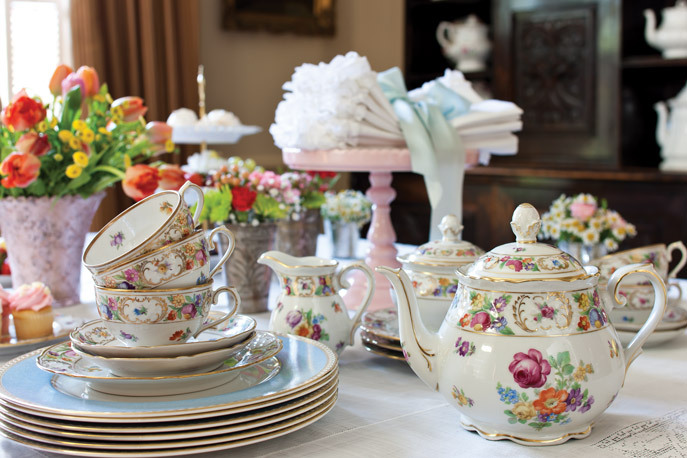 The china, silver, linens, flowers, food, and relaxed time for just conversation with special people in our lives, makes any tea party a memorable time. I have been to up-scale hotels for many teas. I habe been to tea shops for a tea lots of times. I have been to my friends house many, many times for tea. But by far the very best teas were the ones with just my mom at the kitchen table. If it was a special tea we had it in the dinning room. We especially loved it durring halloween and christmas. And of course there were the pretend teas when i was a child. She’s gone now, but i will always cherish the memory of all the teas we had and the memory of her will be in my heart for the rest of my days! I have loved tea parties since I began sipping “tea” from my tiny Blue Willow tea set as a child. Later this month I will host a Downton Abbey Swan Song Tea as a fund raiser for scholarships for women. With the swan theme, decoration will be easy and different from last years event. These are intimate events with just the number of guests to fill the dining room table. Good food, conversation and laughter are the highlights and the scholarship fund benefits! A friend has offered to have a tea for our Music Club Scholarship Fund in her Lovely Queen Anne home in the historic district of our community. How did you handle the invitations and not make them feel that they had to donate to the fund? I would appreciate any pointers you could give us. I was in charge of setting a Ladies Luncheon at our church. We did lavender and yellow cloth tablecloths with matching napkins on round tables. We used teapots filled with beautiful spring flowers as the centerpieces. We set up the room as a garden in the center of our fellowship hall. We placed an arbor in the center, laid black plastic down and rolled up the edges. Placed yellow and purple flowering plants around and filled with mulch. Placed a bistro table and chair set with a teacup, gloves and floral arrangement on the table. Placed a bird bath and clipped on birds from the Dollar Tree Store on the edges. We had other beautiful decorations to fill out the areas. We served lemonade, quiche, spring green mesculen salad with strawberries and vanilla dressing and nuts. I made individual puff pastries filled with white chocolate mousse, sliced strawberries, a drizzle of chocolate on top and a sprinkle of powdered sugar. We served a chocolate covered strawberry on the side. There was a hot beverage station set up with assorted teas and coffees. The children’s meal was served in a beach pail with chicken nuggets, french fries, baby carrots and ranch dip, cupcakes along with other fun kid things including bubbles to blow outside.The men of the church dressed as waiters and served the ladies. It was quite an elegant luncheon and the ladies and young ladies/children enjoyed themselves. We are planning another one for this year and I am so looking forward to it, I have many ideas in place. Like all the wonderful comments I have read, I love tea parties. And, I love the anticipation of it. Trying new recipes, and setting the table a couple days ahead add to the excitement for me. I am planning a Valentine tea for some of the women in our church. All of the guests have celebrated their 80th birthday, and they continue to amaze me with their energy and enthusiasm and their continued community and church involvement. Some play the organ, while others teach Sunday School. Still others decorate the alter or host the weekly coffee hours. I feel so honored to count these delightful women as my friends. I want to pamper them and make them feel very special…….because they are. Thank so much Phyllis. I always look forward to reading your blog and all the responses. It’s like hearing from good friends that I just haven’t met yet! I love how tea parties offer one an opportunity to step back in time to an age when people dressed up for special occasions and enjoyed conversation round a table without the distraction of cell phones. To me, tea parties are about slowing down to take pleasure in the beauty to be found around us–whether that be a grand table spread with the finest linen or a quaint tea tray adorned with a single crocheted doily. Hats and gloves and face-to-face laughter. Simple delights in fancy trimmings. Me? I love the food! The tea parties I have enjoyed most have been the ones where chairs were too small for my proportions and the guests were teddy bears and dolls but they had all the refinement of one spent at the Ritz Carlton. The moments I have spent with my daughter and my granddaughter having tea parties are so precious. Small porcelain teacups and teapots, holding the cup just right and using just the right words like thank you and please and oh so delicious. This has made me want to host a friend’s tea party in the worst kind of way. My friends will have to dress up and wear hats. I am going to use pink tablecloths with white flowing underneath and tables swagged with tulle. A beautiful old hat, hat box and white gloves will be my centerpiece along with pink and white roses and lots of greenery and other colourful blooms. There will be tarts, dipped strawberries, miniature cakes, and tiny sandwiches. It will be the “Old South” for the afternoon. A five year old and a 15 year old will be on the guest list too. Thanks for the inspiration. Will visit Barnes and Noble to get Tea Pleasures. The five ladies whose posts proceed mine have said it all — EVERYTHING! Tea Parties for one or one hundred each is special in it’s own unique way. Fellowship or quiet time, both feed and restore our souls through the sharing of Faith or the quest for discernment! The enjoyment of tea and the associated pleasures and insight truly can be a Blessing from God! I once gave a tea for the ladies in our church. I had the men serve the ladies. The tea was in the church parlor and each round table, I think there were eight tables if I remember correctly, were covered in white clothes. My husband, God bless him, helped me bring all of my prettiest China and all of the silver tea pots. ( I have a few). Each table had a flower arrangement in a china pot along with crystal or silver candle sticks. Each lady dressed in their finest and wore hats. Some of the hats were very old and very pretty. They were served tea, scones, finger sandwiches, and pettifores. All of us were pickled pink and especially with the handsome men serving us. I am hosting a Robert Burns tea party and can’t wait to use pretty Tartan plaid mixed in with my florals! What do I love about a Tea Party? Everything! The aroma, the sight, the taste, the sound and the touch. All of the senses are aroused with delight and then thanksgiving to God results. How good it is to share these pleasures with family and friends. Whether grand and detailed or intimate and simple, the tea party is a unique experience and an exciting opportunity to share our love of good and beautiful blessings. Thank you, Phyllis, for tangible examples of these things in Tea Pleasures. I look forward to getting a copy. I not only love a cup of tea, but the whole ceremony and ritual behind it. Having a long line of British ancestors, I think tea runs through my veins! What’s not to love about snowy white damask linens coupled with gleaming sterling teapots, sugars, creamers, and teaspoons? I always make sure to have a simple floral arrangement that compliments the bone china pieces around the table. Unlike some, I prefer a more unified table with all matching china, sterling, and linen items – I have never caught on to the mix-and-match style which is indeed lovely as well. Silver and/or china trays filled with handmade savories and sweets turn a simple gathering into a feast for the eyes and the palette. The most important ingredient in a successful tea party is the guests who really make the party come alive! What is not to love about a tea party. The linen, the china, the food, the tea and especially the company around your table. This lovely combination makes even a simple Tuesday afternoon, a special event. Victoria magazine has published many books regarding the art of taking tea and I think I have all of them; they’re so beautiful. Thank you. Enjoy your winter and even if it is just you, a good book and a cup of tea, it’s a party!